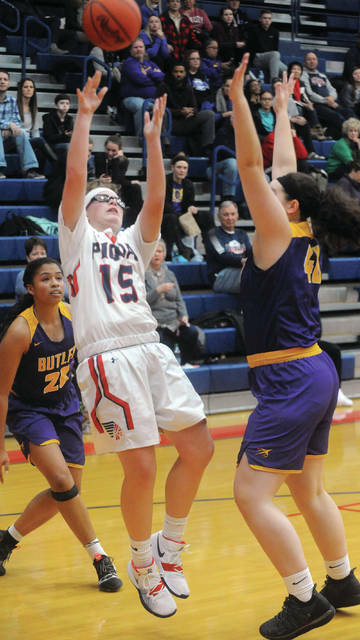 Piqua’s Karley Johns shoots between Vandalia-Butler’s Tyree Fletcher and Megan Allen Saturday at Garbry Gymnasium. 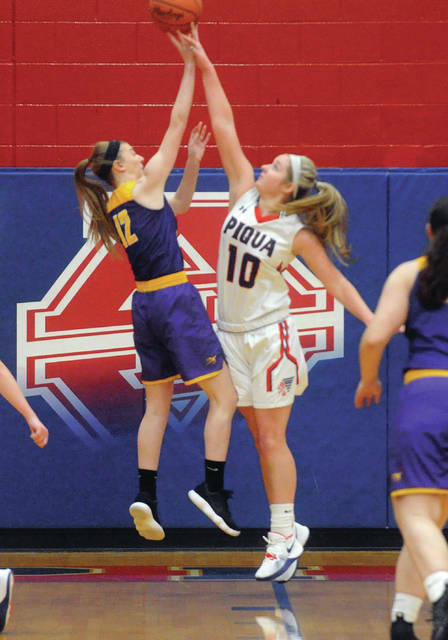 Piqua’s Aubree Schrubb blocks a shot by Vandalia-Butler’s Alla Neely Saturday at Garbry Gymnasium. 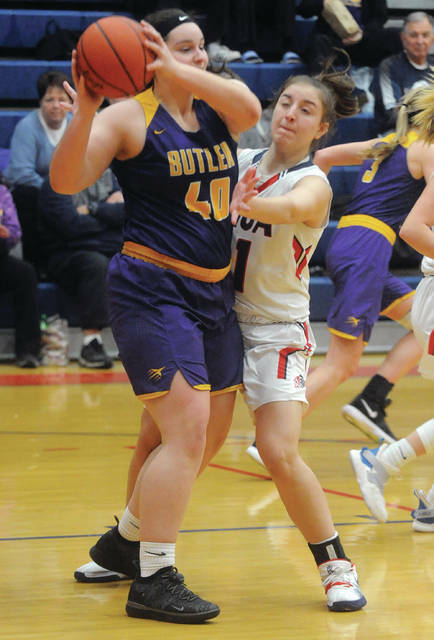 Piqua’s Kelsey Bachman, 22, breaks inside on a pick set by Tylah Yeomans on Vandalia-Butler’s Gracie Price Saturday. Gracie Price started the. run with a 3-pointer. Schoenherr led Vandalia with 16 points, while Evan Neely scored 10 points. Fletcher was a force inside with 11 rebounds, before suffering an injury late in the game. Dalton scored eight points and Price added seven. Jacie Dalton 2-3-8, Abbie Schoenherr 4-5-16, Gracie Price 2-2-7, Tyree Fletcher 2-0-4, Evan Nelly 5-0-10, Ella Neely 0-0-0, Caitlin Plummer 0-0-0, Megan Allen 1-0-2, Olivia Follick 0-0-0. Totals: 16-10-47. Tylah Yeomans 5-4-14, Izzy Kidwell 0-0-0, Andrea Marrs 0-0-0, Kelsey Bachman 2-1-6, Kenzie Anderson 2-0-4, Aubree Schrubb 0-0-0, Karley Johns 2-0-6, Chloe Stewart 0-0-0, Hailey McPherson 0-0-0, Reagan Tate 1-0-2, Skylar Sloan 0-0-0, Kathy Young 0-0-0. Totals: 12-5-32. 3-point field goals — Vandalia: Dalton, Schoenherr (3), Price. 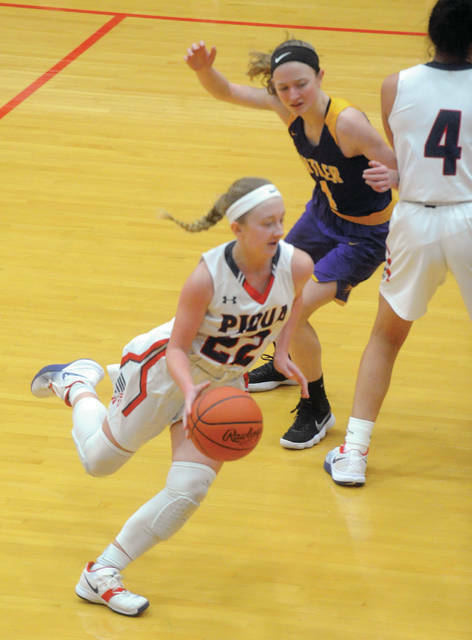 Piqua: Bachman, Johns (2). 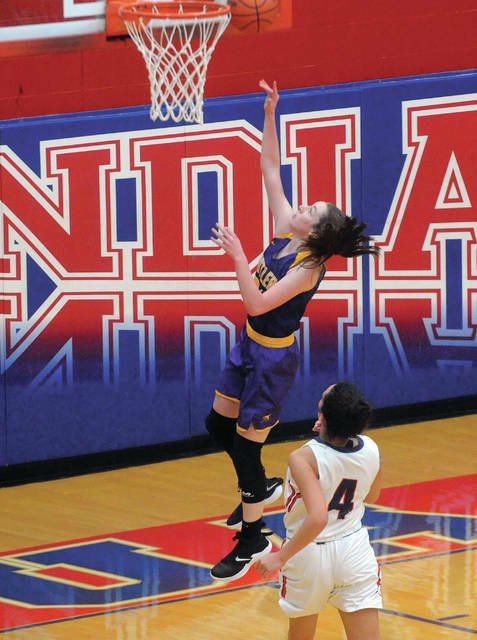 Records: Vandalia-Butler 9-8 (7-4), Piqua 11-5 (7-4). Reserve score: Vandalia-Butler 42, Piqua 37.